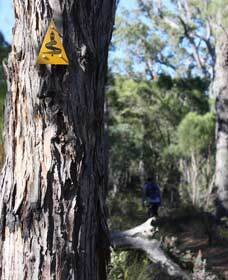 The moderate 2.5 kilometre Mount Dale Walk Trail follows the contours of Mount Dale to its peak, where walkers enjoy panoramic views of the Darling Ranges 60 kilometres east of Perth. 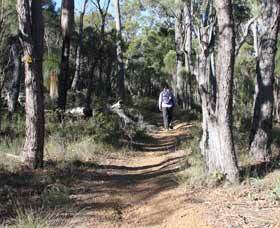 This Top Trail ventures through beautiful jarrah forest taking in the sights of Mount Cooke to the south and the farm lands to the east. 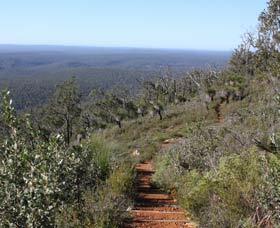 Initially the trail is easy to follow through the bush but requires some navigation before ending up at the lookout. From here on descent, the trail joins up with the Bibbulmun Track, returning to the Mount Dale picnic area where there are tables and a toilet. 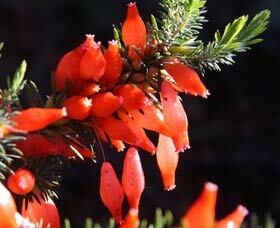 The Bibbulmun Track, which runs from Kalamunda to Albany, travels close-by to Mount Dale and the lower recreation area provides an ideal drop-off/pick-up point for walkers using the Bibbulmun Track. An animal viewing hide has been constructed on the north side of Mount Dale and provides spectacular views over the Helena National Park and the Darkin River Valley.